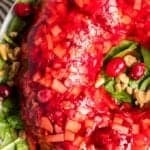 This cranberry jello salad from the Mennonite Community Cookbook is a beautiful addition to any holiday dinner menu. 3 Apples Pared and cored. Wach and chop cranberries. A few pulses in a food processor works well. Pare and core apples then chop finely. Add chopped oranges, nuts, and. sugar to the cranberries. In a separate mixing bowl, dissolve the gelatin in hot water and whisk vigorously for two minutes. Add the cold water and mix well. Allow the gelatin to cool and to start to set and then stir in the cranberry mixture. Pour the mixture into a salad mold or a bundt pan prepared with a non-stick cooking spray. Allow cool and congeal completely and then unmold onto a bed of salad greens. Garnish with additional whole cranberries, if desired.